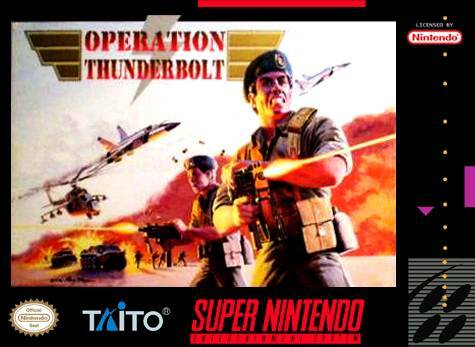 Operation Thunderbolt for Super Nintendo has you infiltrate the area and rescue the hostages from terrorist that have hijacked Trans Global Flight #520. you are armed with the latest anti-terrorist equipment including assault guns and rocket launchers. To keep you well armed, supply planes will drop crates of ammunition or collect the ammo dropped by the enemy. For the most intense action, you can use the Super Scope or Super Nintendo Mouse.